Comet 209133A. Comet Industries 40D (7.5” Dia.) 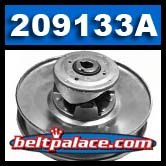 Driven Clutch #209133A. 3/4" Bore. Home > COMET INDUSTRIES BELTS > COMET 203787 (A-DF), Comet Industries replacement belt. > COMET 203788 (A-DF). Genuine COMET BELT 40-100 for Comet 40/44 Series Go Kart > Comet 209133A. Comet Industries 40D (7.5” Dia.) Driven Clutch #209133. 3/4" Bore. Comet 209133A. Comet Industries 40D (7.5” Dia.) Driven Clutch #209133. 3/4" Bore. Comet 209133A. Comet Industries 40D (7.5” Dia.) Driven Clutch #209133. Specifications: Symmetric Belt System, 3/4” Bore, 7-1/2" Diameter, 3/16" keyway. REPLACES: Brister, Ken-Bar, Carter Brothers, and Manco Driven Clutches. Comet/Hoffco 209133-A. Comet 209709A. Model 44C "Magnum" Drive Clutch. 3/4" Bore. 3/16" keyway. Comet 209709A. Comet Industries 44 Series MAGNUM Drive Clutch. 3/4" Bore. Comet/Salsbury/Cushman Part 209709-A. Comet 206458-A Button Inserts for Comet 40/44D, CAT99 and TC88 Driven Clutches. Comet 203788 (A-DF) Go Kart Belt. Replacement belt for Comet 40 and 44 series Belt 40-100: COMET 203788 and 203788A/DF. 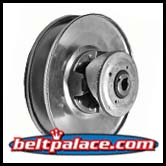 Replacement for 40-100 OEM Torque converter belt. Comet 203043A YELLOW Clutch Springs. Package of 3 Yellow Springs for 40C Drive Clutch. Comet 203043A YELLOW Clutch Springs. Package of 3 Yellow Springs for 40C Drive Clutch. Replaces Comet 40 Series Yellow Spring and GTC 40 Series. Comet 203040A RED Clutch Springs. Package of 3 RED Springs for 40C Drive Clutch. Comet 203040A RED Clutch Springs. Package of 3 RED Springs for 40C Drive Clutch. Replaces Comet 40 Series RED Spring and GTC 40 Series. Comet 209621A. Comet Industries 44D Series Driven Pulley. THREADED Post & Cam. Comet 209621A. Comet Industries 44D Series Driven Pulley. 8-1/2" diameter, 3/4" Bore, THREADED Post & Cam. Comet/Salsbury/Kartco Part 209621-A. Comet 203031A Bronze Bushing for 40C Drive Clutch. Replaces Guide Bushing for Kenbar 400-007, GTC 203031-A. Comet 203044A. Package of 3 “Spring Clips” for Comet Industries 40 SERIES “40C” Drive Clutch. Comet Industries 203044-A. Comet 209418A. Comet Industries 44 MAGNUM Series Drive Clutch. 1" Bore. Comet 209418A. Comet Industries 44 MAGNUM Series Drive Clutch. 1" Bore. Comet/American Sportworks-ASW/MANCO Part 209418-A.